This image, dated January 12, 2008, shows both SN2007uy and SN2008D (the bright spot near the northern tip of the galaxy) two days after the discovery of SN2008D. A supernovaspotted earlier this year may actually represent a cosmic event closer toenergetic gamma ray bursts, rather than classic stellar explosions. 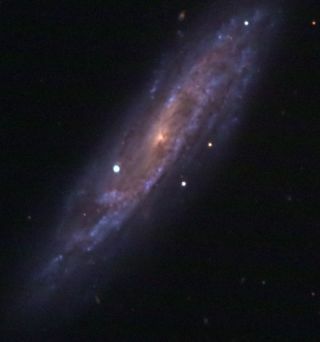 Europeanresearchers now suggest that the supernova known as SN 2008D resulted from amassive star collapsing into a black hole. That event produced a five-minutelong burst of X-rays, which NASA?s Swift telescope detected on January 9, 2008. "Ourobservations and modeling show this to be a rather unusual event, to be betterunderstood in terms of an object lying at the boundary between normalsupernovae and gamma-ray bursts," said Paolo Mazzali, an Italianastrophysicist at the Padova Observatory and Max-Planck Institute forAstrophysics. Stars thatwere about eight times more massive at birth than our sun end their relativelyshort life in a cataclysmic explosion and collapse into either neutron stars orblack holes. The massive exploding stars emit a shortcry of agony in the form of light, X- or gamma-rays, with gamma-rays beingthe most energetic. Mazzali?steam found that the early behavior of the supernova indicated that it was ahighly energetic event for a supernova, although not quite as powerful as agamma-ray burst. Theoretical models show that the original star was at birth asmassive as 30 times the Sun, but had lost so much mass that at the time of theexplosion the star had a mass of only 8 to10 solar masses. The likely result ofthe collapse of such a massive star is a blackhole. The originalstar also shed much of its hydrogen and helium-rich outer layers beforeexploding, characteristics normally associated with gamma-ray bursts. However,Mazzali?s team saw a helium signature still lingering in the explosion?saftermath, which suggests that the star did not quite reach the level of agamma-ray burst. Thispresents an alternative explanation to one detailed earlier in the journal Natureby another group of astronomers. That team suggested that X-rays were detectedonly because stargazers caught the star in the act ofexploding, and that the event was a more typical supernova.